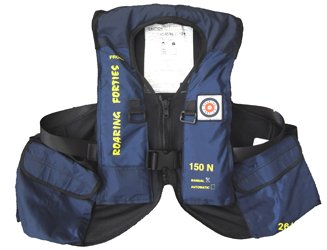 ROARING FORTIES™ TSV1060 is an Australian Standard(AS 4758) & ISO( 12402-3) approved 150N PFD/lifejacket. This has the same properties as the popular ROARING FORTIES™ SMA1060 series except that the valise is sewn onto a mesh vest. Like all our inflatables, it is relatively light weight & is very economical to repair or service. 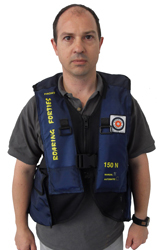 The TSV1060 series is a mesh vest design inflatable PFD which makes donning simple and effortless. 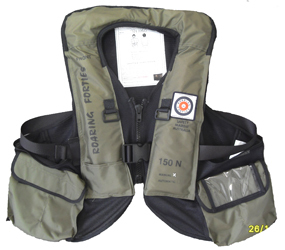 This PFD when donned sits above the waist which makes it popular with fishing kayaking. 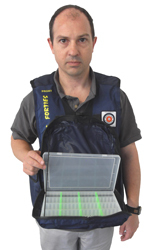 The PFD comes standard with side pockets on the mesh vest for your fishing kits/emergency items. 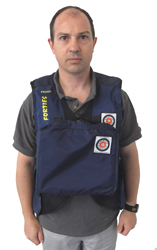 This inflatable PFD/lifejacket is suitable for all seasons. Detachable front pocket for tackle box. Ideal for kayak fishing.